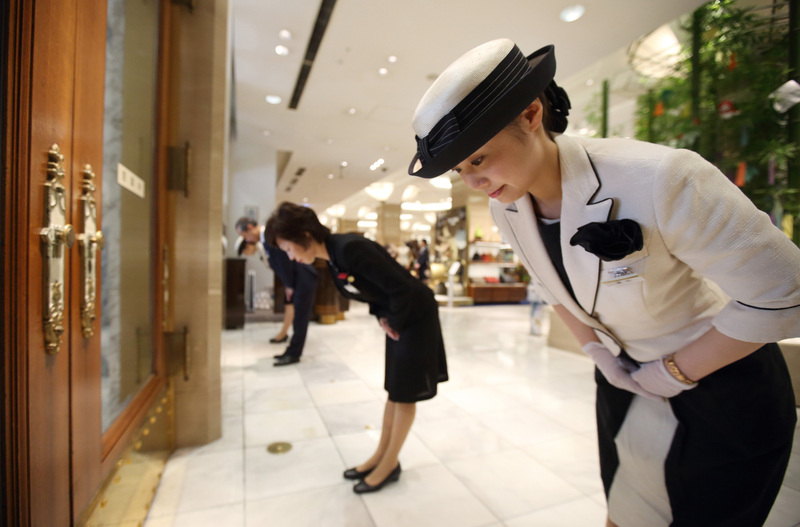 Customers are gods, as a saying goes in Japan, where staffers press buttons for shoppers in department store elevators and hotel porters line up to bow to guests. While Japan is revered for this hospitality, or omotenashi, all that bowing and scraping may be sapping productivity. So much so that the nation has ranked lowest of the Group of Seven nations by that measure for nearly 30 years. With Japan facing a labor shortage as the population ages — the jobless rate is at its lowest since the late 1990s and projected to fall further — Prime Minister Shinzo Abe wants to more than double productivity growth in the service sector by 2020. 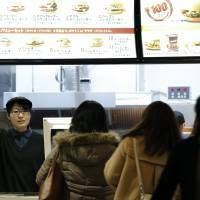 He is targeting the service sector, which makes up about 70 percent of the world’s third-biggest economy, and has failed to embrace technology like Japan’s manufacturers. A public-private sector panel on productivity last month gave examples of how costs can be cut through innovation while maintaining the level of service that people expect in Japan. The Taiho Japanese restaurant in Tokyo uses tablet computers to cut out middlemen and place orders directly with fishermen, while the Yumotokan hot springs group has conveyor belts to send food to waiters out of sight of diners in its banquet halls. These technologies are used behind the scenes, while customer-facing service remains intact. Japan Airlines Co. defines omotenashi on its website as “a completely selfless approach to receiving guests” in a country where customers are not expected to tip for good service. Kiyoko Kondo embodies omotenashi. She’s greeted clients at the flagship Mitsukoshi department store in central Tokyo for 35 years and is able to welcome more than 300 regular customers by name. Productivity — calculated as gross domestic product per hour worked — was $41.5 in Japan last year, versus more than $50 in all other G-7 nations, according to Organisation for Economic Co-operation and Development data. The U.S. led the pack at $67.4. The gap is worse in the service sector. Productivity at restaurants and hotels was 26.5 percent of that in the U.S., and about 41.5 percent in the retail and wholesale sector, according to an industry ministry report in 2013. At a meeting with private and public sector leaders on June 18, Abe said he wanted to spur a “revolution” in service productivity. This panel designated five service sectors — restaurants, hotels, retail, health care and transportation — as having low productivity. Japan is performing more strongly in areas such as finance and banking, doing better than France and Germany, the ministry report showed. One sector where Japan’s hospitality is paying dividends is tourism, where, helped by a weaker yen, visitors have nearly doubled since 2013. The nation is ranked first out of 141 countries on its “treatment of customers” by the World Economic Forum, and Abe wants to harness this to boost Japan’s image overseas in the run up to the 2020 Olympics in Tokyo. The challenge, however, is to monetize this hospitality while maintaining high standards. 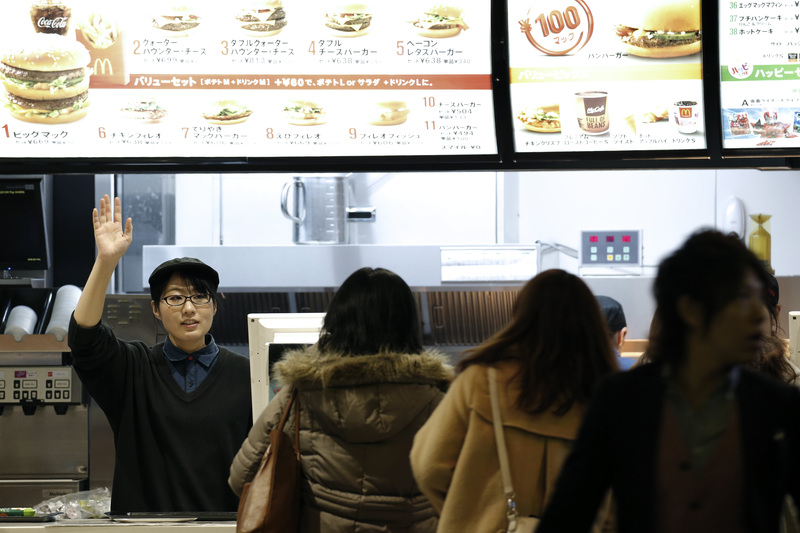 This complimentary-service strategy has been embraced by McDonald’s Corp.’s Japan business, where the restaurants’ menus offer a free smile to customers.